Oh my goodness, I felt the same way about this book when I was young. I have a copy on my bookshelf and was thinking it was time to read again. I also loved Find a Stranger, Say Goodbye by Lowry. It was about the girl at 18 who decided to find her birth mom. Something completely foreign to me too. Oh, I haven't read that one. I'll have to look for it. I've never read this. Must remedy! I haven't read this one either! As far as books from my childhood, the ones I remember best are Charlotte's Web and Where the Red Fern Grows--still two that top my favorite list as an adult. I was going to post about Charlotte's web and some of the other E.B. White books, but Stuart Little has gone missing, much to my horror. Will have to look for it! I remember this book! This was one of my most memorable books of childhood. I have a sister, so I thinks that's why it affected me so much. It really stuck in my mind. I remember this story so well and I still have my copy from when I was a kid. I am so glad that my school library has TWO first edition copies of this. I remember this so well, and it does still go out. I must have read Find a Stranger, but don't remember it well. 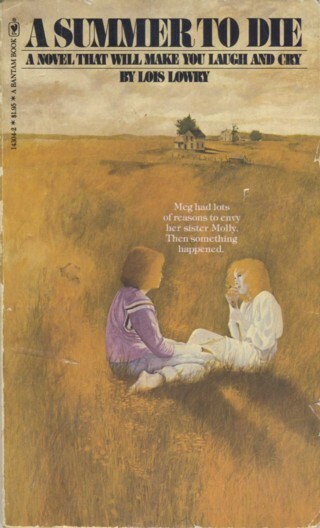 For almost 35 years I searched and searched for the name of this book, I remembered in detail the girl, her sister and how her sister was dying, I also remember the painted egg in the book. I actually tried to do an egg like she described every year on easter since then. That book and story affected me that much. I read the book after losing my grandpa to cancer when I was about 14.